My students will tell you that I’m not the most organized teacher out there. I’m forever looking for a certain book or sheet. And all this disorganization takes away valuable teaching time. Because of this I do anything possible to save time in other areas. That’s what inspired me to create Easy Chart Maker. 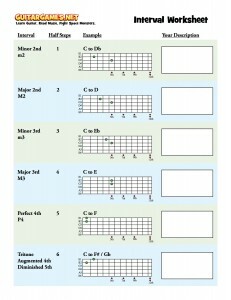 It’s a tool to create scale and chord charts. It’s my hope that it will save both teachers and students valuable teaching and practice time. I hope you like it! Tab Warrior: Journey to Fretopia is now available for the iPhone. Go to iTunes and get started mastering the fretboard the fun way! 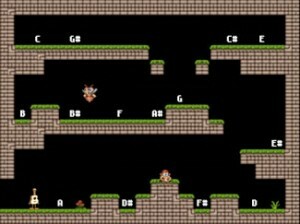 GuitarGames.net is proud to announce the release of our newest music theory game: Woody’s Music Theory Adventure! 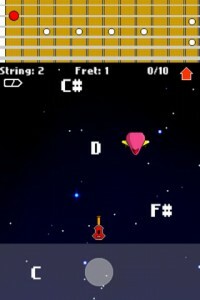 It is the first game that not only quizzes, but teaches you music theory as you play. We tested it on non-musicians, and by the end they knew the musical alphabet, sharps, flats, whole-steps, half-steps, the formula for major scales, and how to construct them. It’s a great game for kids or adults new to music. More info here or play it now! Wouldn’t it be great if you could hear notes on a recording and find them on your guitar instantly? 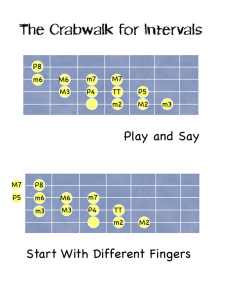 Intervals are the link between hearing notes and finding them on the guitar. For the past month we have been working on interval ear training, now it’s time to look under the hood and understand how intervals work. Have you ever wondered what major or minor mean? Or why some intervals are called perfect? Attend our Music Theory Webinar! How learning intervals can make you an awesome guitarist! The webinar will take place on Saturday, November 26, 2011 at 1pm EST. To sign up visit our webinar page. Attendance will be limited to 25. I hope you can make it! Relate: sounds like the beginning of a song- happy birthday, jaws, Star Wars, etc. 3) Share: Feel free to share what you hear in the comments. For a bonus see if you can hear the Stars Wars theme and Here comes the Bride in the new intervals (P4, tritone, P5, m6). I use both of those to this day. After completing the interval worksheet for the Perfect 4th, Tritone, Perfect 5th, and Minor 6th play Ear Tester using just these intervals. Can you reach 90% accuracy or above? How about with all the intervals we have covered so far? Next week one more assignment, and then I’ll be scheduling the second webinar, probably around Nov. 19th, so we can get it in before Thanksgiving. We’ll cover the theory side of things. I’m looking forward to it, hope you are too! As promised here is your assignment for this week! Play Ear Tester using the minor 2nd, major 2nd, minor 3rd, and major 3rd. Keep an eye on your percentage(%) correct. Aim for 90% or above. Try to play a little everyday and watch your % increase. Play Woody Says. Start with level 1. See how many melodies you can get in a row! That’s all for now. I’ll have a new assignment next week. Have fun! I’ve been teaching guitar to children for many years. 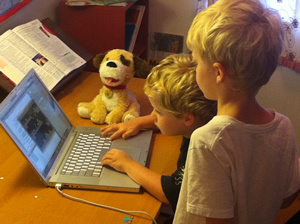 They were the original inspiration for the games on this site. The challenge was, how do I get kids excited about music theory and ear training? Fast forward five years. I’m beginning to see some startling results. Namely this: Students who work on theory and ear training learn to play the guitar faster. This was an amazing discovery for me. Yes, I always knew that learning music theory and ear training was important, but I was told that reading music and traditional methods of learning were slower than the tab approach to learning guitar. I have had several amazing experiences recently that have turned this idea on its head. What I found was that students who played Woody Says (an ear training game) frequently, have the ability to hum a note and instantly find it on the guitar. Like most students they would get to a point in a song where they played a wrong note or forgot the next note. But, unlike the average student hunting for the next note, they would hum the missing note and wham! They were able to play it immediately. Because of this connection between sound and fingers these students learned faster than the students who didn’t play the games. I came to this realization: Students who have connected the sound of music to the locations on the guitar learn music faster. I have a student who can sing a melody and name the finger numbers needed on the spot. How? Woody Says and Ear Training! Ear training and music theory can have the same effect on your guitar (or bass) playing. You can learn to play guitar with less struggle. Sound and the fretboard can become one reality instead of two separate worlds. The games on this site can have this effect on your playing. To jump start your journey into ear training I’m putting together a series of online webinars (classes) on ear training. The first webinar will focus on interval ear training. Even if you’ve no idea what an interval is, you’ll do just fine. I’ll also introduce Woody Says and get you started on it. The second webinar will focus on the musical alphabet, half and whole-steps, scales, and intervals. These are the essentials of music theory, and what you use 90% of the time. I will also cover playing intervals on the guitar. The third webinar will tie the ear training and the music theory together. This is where amazing things start to happen, and you’ll start to see your abilities take flight! I’ll finish up with how to play Woody Says in blind fold mode, the ultimate challenge. If you are interested in learning the guitar faster sign up for the webinar today! Click here to register. The first webinar will take place October 22, 2011, at 1 pm (EST). The webinar is free to GuitarGames.net members, but limited to 25 students.